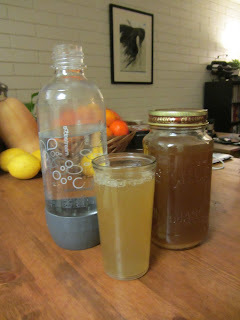 Mike is Bored: Homemade ginger ale recipe. 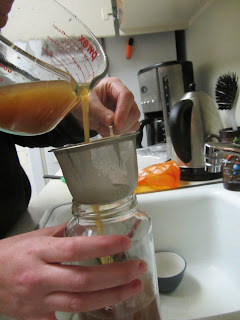 Syrup method for SodaStream. Homemade ginger ale recipe. Syrup method for SodaStream. You will also need to buy soda water or make your own soda water . Peel and then grate the ginger. Mix the juice and zest with the rest of the ingredients in a sauce pain and simmer for 30 min. Strain with a tea filter. Finally mix the syrup 1:5 or to taste with soda water.